It feels like we're realising a long-lived dream finally and it feels good. It's a new semi-detached barn conversion with 3.2 acres of field outside Nantwich. The plot total for the development is 8 acres, we've got the lion share of the field and there's a communal pond and woodland, which is just a few years old, we've now been given a 50m x 55m section of the woodland on the end of our plot, which Happytechie is very happy with as he had his heart set on a woodland. The plan is for the long section at the start (access is on the top left corner) to essentially be a big garden, starting with a sensory garden, which is the only definite in this plan (and not necessarily as drawn, I'm just playing at the moment). We've walked it a few times over the wet weather but now the boundary plan is final we can go and plot wet/dry areas in our actual plot and take soil samples, etc. First up is just getting moved in! The house is amazing. Those who might not know us of old, our youngest daughter, Willow, is severely disabled, she's non-ambulatory and non-verbal. She has sight and hearing impairment but it's mild. The house has a lovely living space that's all downstairs plus another big space upstairs that will eventually be Arthur's space, somewhere where Willow has no access to as she gets bigger and we can no longer carry her up, which is something he will need, it's not an easy life being the sibling of a severely disabled child. 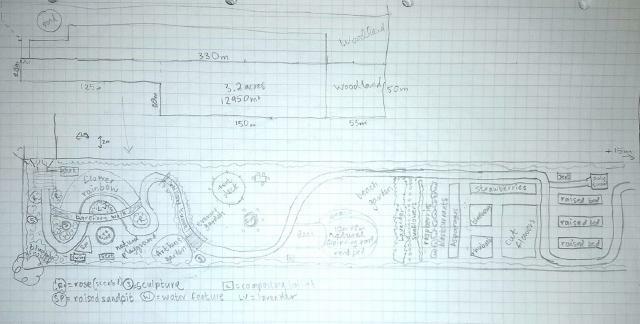 Anyway, here's my little plan that I sketched last night with our new dimensions. The big field will have a large British native wildflower meadow and bees, plus an orchard, not sure where the chickens will go just yet. I'd like it to be totally wheelchair accessible in its final state so that Willow can be with us wherever we need to be and be able to access our whole plot, that just needs to be a nice wide, flat, smooth path with a few little lookout areas. I'd really like to be able to invite other disabled children to enjoy it, too, I'm sure Willow's class will at least have a school trip out to us. The tent space is a decked/hardstanding area to pitch our 6m bell tent in the summer, either for guests or us, thinking this will also have a mobile hoist and hospital bed in it for disabled visitors and maybe for inviting families to come and have a glamping holiday, which is a dream of mine. Best of luck! seems like a lot of work, but should be rewarding. I would offer to help, but for being old! You are not too far away, about 30 miles. You are in a good growing area, a friend has a farm at Malpas, and their grass is well ahead of many, some years the cows don't come in even at night even though they have access to warm cubicles! Sounds great Fee. Best of luck with it. If you decide Willow needs to get upstairs it might be possible to put a lift of some sort in. I can understand why Arthur may want his own space, but that could be rather a big area to 'own' from what you say. Yeah, it is a big area, we're looking a fair way in the future though, the way things are with housing in the UK right now, I doubt he'll be flying the nest at 18. Lifts are a pain which is why this house is perfect, there is everything we need downstairs, upstairs is a bonus. For the foreseeable future it will be a guest bedroom and our home ed learning space/sewing room/craft room/junk room. And HT and I might move up there first, at the moment we need to be close to Willow for frequent night time trips to her room for suction, etc. One of the other factors that pushed us to move from Hampshire was that we needed to put a lift in for Willow, but we knew it wasn't our forever house, selling a house with a lift isn't easy and if you want to take it out to sell, it's expensive, so we've done a lot of research and we've looked at more houses than I care to remember. The other thing about lifts is the maintenance cost, you get help to pay for them and installing them through a disability facilities grant but they don't pay for maintenance or repair after a certain number of years. If we ever feel Willow needs access to upstairs, I can't see why she would, but if we did, it's certainly an option. I would be very happy if we never had to move house again!! I can see why a lift would be difficult. If she needs a lift her chair can run into, it would need to be a full lift, not just a stair lift or something. Housing in Hampshire is expensive, and you are certainly going to get a lot more for your money elsewhere. Hope it all works out well for you. I sometimes wonder about getting out and into an area with fewer people, but think I am probably settled here forever now with the woods. That's right, Mistress Rose, it's a through-floor lift she would need. We lived in Surrey/Hampshire for 19 years, but it was always our plan to move out when the time was right to get a place with some land. When Willow was born the game changed and having all our support in place and her settled in school made it much harder to move but we decided it was time to just go for it, now or never! Happytechie got a job in Stoke, we planned to buy a house in Staffordshire moorlands, plenty available, but not really knowing the area we decided to rent for 6 months while we find out where abouts we'd like to live. And to take the pressure off the buying/selling process. Good job we did because Staffordshire is clearly not the place to be a disabled child!! We looked at schools over the border into both Derbyshire and Cheshire for Willow and checked out the hospitals. We had an offer accepted on a house in Derbyshire first, but the vendor changed his mind and pulled out! Hope it all works out for you now. A good school is in some ways more important for a disabled child that an able one, and of course you want to have other suitable care/support as well. Look forward to the continuing saga as you get the house and garden sorted. Exciting developments, Fee ! Hopethe move goes well and you get settled in. Hi gil, nice to see you!